Media captionThe new £1.35bn Queensferry Crossing comes to life in multi-colour. 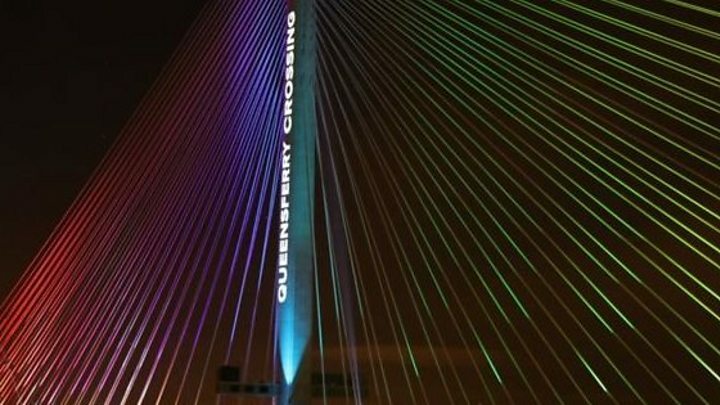 The new £1.35bn Queensferry Crossing has been lit up to mark the handover of the bridge from the contractors to the Scottish government. The 1.7-mile (2.7km) crossing over the River Forth will fully open to traffic for the first time on Wednesday. On Monday night, a procession of vehicles travelled across the structure ahead of a handover ceremony. First Minister Nicola Sturgeon then switched on the lights and a projection was beamed over the entire bridge. Addressing workers on the crossing, Ms Sturgeon thanked them and told them they had "made history". She added: "Design, engineering and construction - in its own right it is absolutely amazing. "But when you put it into the context of these two other amazing bridges, what you have done here is create something truly special. "This is going to be a tourist attraction. It adds beautifully to the Scottish skyline." Image caption Spectators watch the "switch-on"
The new crossing will take most of the vehicles that currently travel over the 53-year-old Forth Road Bridge. The new bridge has been "designed for maintenance" to ensure it runs smoothly for decades. To avoid closures the Forth Road Bridge has faced in bad weather, wind barriers have been installed along the Queensferry Crossing which can withstand the strongest gusts. Engineers believe the crossing will never have to close to vehicles in strong winds, saying "if you can drive to the bridge then you can cross" as the barriers will make the bridge calmer than approach roads. Police will put in place a rolling roadblock to stop traffic driving across the Forth Road Bridge and will redirect them across the Queensferry Crossing. It will remain closed until the early hours of Thursday morning.